Democrats and Republicans got into it on the Senate floor over the Green New Deal. Senate Minority Leader Chuck Schumer chided GOP lawmakers for not offering an alternative plan. Senate Majority Leader Mitch McConnell and GOP senators criticized the Green New Deal’s high cost. A rhetorical brawl over climate change broke out on the Senate floor as Democrats chided Republicans for criticizing the Green New Deal without proposing an alternative plan. Senate Majority Leader Mitch McConnell and other GOP Senate colleagues took to the chamber’s floor to criticize the Green New Deal, ahead of a planned vote on the sweeping resolution to massively expand government control in the name of climate change. Democrats, however, are trying to turn the tables on Republicans to side-step being tied to the Green New Deal. Senate Minority Leader Chuck Schumer chided GOP lawmakers for not offering their own climate policies. “We know what he’s not for, what is he for?” Schumer said while Cornyn spoke on the Senate floor. I’ve been looking all over for it, but I still can’t find the Republican plan to tackle climate change. U.S. Senate Minority Leader Chuck Schumer (D-NY) speaks after a Democratic policy lunch on Capitol Hill in Washington, U.S., March 5, 2019. REUTERS/Jim Young. 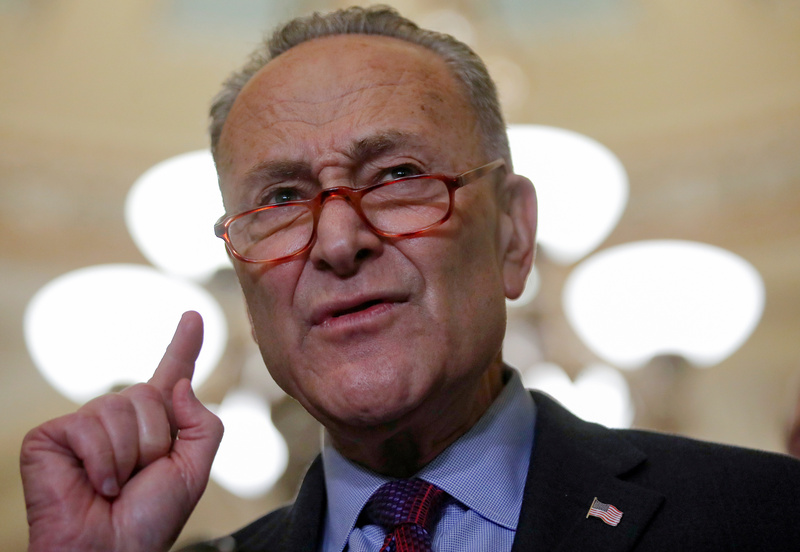 Schumer’s plan is to make climate change a top issue in the 2020 elections while also putting pressure on Republicans to put forward their own climate policies. Schumer also plans to have Senate Democrats vote “present” when the Green New Deal comes up for a vote in the coming weeks. Republican Wyoming Sen. John Barrasso shot back at Schumer, arguing there is a conservative answer to the Green New Deal — innovation. Barrasso’s op-ed from December 2018 argued innovative technologies, not heavy-handed government, were the answer to climate change. Specifically, Barrasso pointed to nuclear power and carbon capture technology, and rejected carbon taxes and more regulations. GOP lawmakers also criticized the Green New Deal resolution’s estimated high cost, and the infeasibility of getting to “net-zero” greenhouse gas emissions within 10 years while also dramatically expanding the welfare state. Republican Iowa Sen. Joni Ernst gave the Green New Deal her monthly “Squeal Award” for its estimated high price tag of $93 trillion over 10 years — based on a report by the right-leaning American Action Forum. “Which is roughly $10 trillion more than the entire recorded spending of the United States government since 1789,” Ernst said on the Senate floor. “It’s no surprise that Democrats are trying to duck this big green bomb,” Barrasso said.